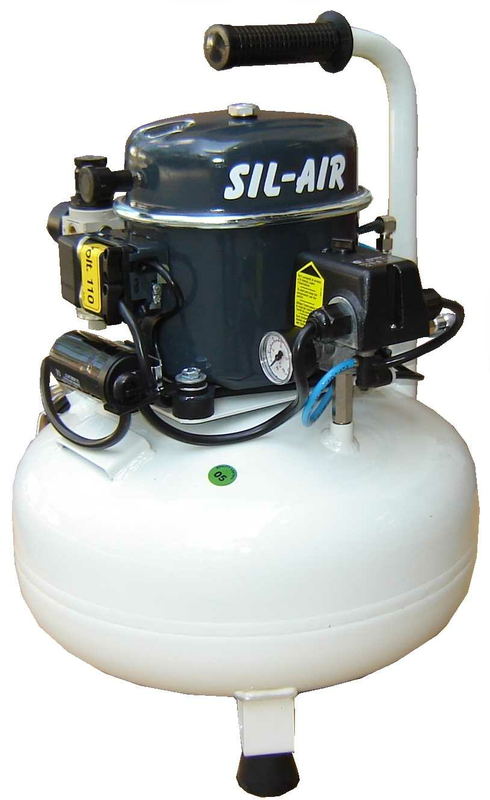 Silentaire Sil-Air 50-24 Our Sil- Air compressors are designed specifically for artists. Note that they differ from regular air compressors found at tool suppliers or hardware stores in that Sil-Air units have air pressure regulators and gauges, which allow for a controlled, consistent air stream with minimal spray pulsation. This gives you the freedom to express your art without worrying about pressure changes. In addition, a moisture trap helps keep component-heat and climate produced condensation out of the air line. Another advantage is the quiet atmosphere. The Silentaire Sil-Air 50-24 is almost silent, allowing for better thought concentration. Finally, the safety valve and air intake filter protect you and your compressor, while a convenient carrying handle or wheel provides portability for the artist on-the-go.